Digital Politics Radio: Engagement with online political ads & content more significant than with consumer brands with viewers showing strong desire to share political content on social media and ways to establish an online conversation. Interview with Jay Samit, CEO SocialVibe. Digital Politics Radio: Value exchange web ad engagement, insights about targeting, sharing, persuasion, fund raising and turning online social media friends into "digital block captains." Interview with Jay Samit, CEO SocialVibe. A Socialvibe study shows social media will play a vital role in determining the 2012 election. With a 94% participation rate for engagement on political advertising campaigns the Socialvibe study shows that Facebook friends, not the evening news or TV advertisements, will inform most voters. The SocialVibe study (PDF) finds people are more likely to share interesting news articles, videos or online petitions with one-another via Facebook or email than they are to watch the nightly news. More than ever before, voters expect to be given an opportunity to express themselves and interact with information by sharing with friends, posting to Facebook, tweeting and commenting on posts.Candidates must effectively engage the social sphere from the outset to remain competitive in this election cycle. The E-voter Institute reports in its 2010 survey of voter expectations that more than 40 percent of voters expect to be able to find information on demand about campaigns, including online video and social networking. The vast majority of voters expect that all campaigns will have at least a basic website. But that’s just the ante to get into the game. No online presence would be complete without a robust social strategy. Voters of all ages and persuasions are increasingly turning to social media for information about issues and candidates. According to a January 2011 report from the Pew Internet American Life Project, Republicans and Democrats used social media to gather or share political information at roughly equal rates in the 2010 midterm election cycle. According to a May 2011 study conducted by digital agency SocialVibe, 94 percent of social media users of voting age engaged by a political message watched the entire message, and 39 percent of these people went on to share it with an average of 130 friends online. As reported by the Christian Science Monitor, this trend reflects a major shift from the 2008 presidential election cycle, in which only 29 percent of McCain voters were active users of social networking sites compared to 44 percent of Obama supporters. According to a May 2011 study conducted by digital agency SocialVibe, 94 percent of social media users of voting age engaged by a political message read or watched the entire text or video message, and 39 percent of these people went on to share it with an average of 130 friends online. The deep attention and loyalty that results from viral message sharing is why brands such as Microsoft, Proctor & Gamble, Coke, Disney, and others are shifting their advertising dollars from television to social media. Every major television network has turned to social media to advertise their own TV shows and connect with their audience. As of May 2011, 71% of online adults reported watching videos on a social video-sharing site such as YouTube or Vimeo, according to a Pew Research Center video-sharing study. That represents a five-percentage-point increase from the 66% of online adults who reported being video-sharing site users a year earlier and a 38-point increase from five years ago when the Pew Internet Project took its first reading on use of such sites. The Pew study further found that non-white adult internet users have higher rates of video-sharing site use than their white counterparts, a consistent finding since 2006. Overall, 69% of white internet users said they had visited video-sharing sites, 13 points higher than in April 2009, and more than double the 31% reported when the question was first asked in December 2006. At the same time, 79% of online non-whites -- African-Americans, Hispanics and others -- reported using video-sharing sites. That figure is 12 points higher than April 2009, and 41 points higher than in 2006. 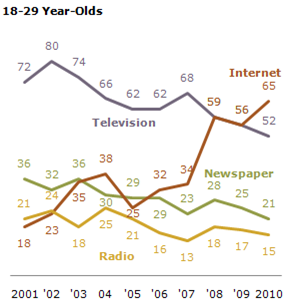 Then there is Pew's study from this past winter that reports an ongoing trend of more and more people getting their news from a variety of Internet sources rather than newspapers or TV. The most significant challenge in this arena is presenting information to political supporters in a manner that motivates them to share campaign information with others. As noted by the E-Voter Institute, “When people are inclined to forward email and links, campaigns need to be more creative in messaging so as to tap into that desire to share compelling content and ideas.” Voters and supporters are actively engaged in social networking of all stripes – the challenge is for campaigns to translate that energy into increased sharing on social networking sites. As the 2012 elections approach, social media engagement has become a key tenet that must be built directly into every campaign strategy. Campaigns hoping to lead in 2012 need to look to proven social methods to reach, engage, and motivate supporters with messaging that is true to their brand and ignites conversation among key influencers. Use Facebook, video-sharing and Campaign Websites to Engage Supporters - For campaigns to make the most of their investment in an online presence, they must provide opportunities for engagement. Make Your Social Presence a Conversation - A robust social networking strategy will allow campaigns to engage supporters in sharing and to monitor opposition messages. Go Mobile - Roughly equal numbers of Democrats and Republicans use mobile technology to share information about political issues. QR codes, mobile use of social networking, and mobile advertising will all play an important role in 2012. Make E-mails Social - The technological savvy of many voters is still limited to email. And according to the Nielsen Company, active users of social media tend to spend more time using email than others. Social media-enhanced email is cost-effective and allows supporters to forward information in their own time. Build Allegiance through Engagement Web Advertising - Engagement advertising enhances consumer loyalty by combining campaign content with word-of-mouth commentary from friends and associates. Engagement advertising creates a value-exchange that invites participants to share professionally produced video messages with others and allows advertisers to target ads within Facebook based on whatever criteria they choose. The SocialVibe study found that the level of sharing in a politically-themed engagement web advertising (messaging) campaign was double the average share rates of non-political ad campaigns. Perry Fed Up With His Book "Fed Up?" A Dominionist Movement For Theocratic Government? Gov. Perry's Miracle - All Hat, No Cattle? Texas Ag Commissioner "Pray for Rain"